Fish are cold blooded, live in water and are covered in scales. They breathe through gills located on the sides of their heads. Their gills take oxygen out of the water around them so they can breathe. Their limbs, if they have any, are in the shape of fins and do not have digits. They exhibit greater species diversity than any other group of vertebrates, with over 32,000 known species. Fish live in oceans and freshwater ecosystems. Well adapted to their water world, fish secrete a special type of mucus from their skin. The slime coating helps them move through water faster, protects them against parasites and diseases and covers wounds to prevent infection. Fish orient themselves using landmarks and mental maps based on multiple landmarks or symbols. They possess spatial memory and visual discrimination. Most fish have color vision that is at least as good as a human's. Many fish also have chemoreceptors that are responsible for extraordinary senses of taste and smell. Sensitive receptors allow fish to detect gentle currents and vibrations, and to sense the motion of nearby fish and prey. Some fish have organs that detect electric currents. Some can even produce electric currents, which they use in navigation and social communication. Over 97% of all known fish are oviparous, that is, the eggs develop outside the mother's body. Newly hatched babies are called larvae and do not look like their parents until they go through metamorphosis. Jaws allow fish to eat a wide variety of food, including plants and other organisms. Many are specialists, eating very limited diets. Others will eat almost anything. Cleaner wrasses eat parasites off of other fish, setting up cleaning stations that predators visit who even allow the wrasse into their mouths to clean their teeth. Fishing, rising water demand, river dams, water pollution and invasive species place aquatic ecosystems among the most endangered on Earth. Therefore, the fact that many species of fish – both marine, and freshwater – are currently endangered, does not come as a surprise. More than one fifth of all known fish species are now considered to be at imminent risk. Fish range in size from the nearly microscopic to the gigantic. The longest fish is the whale shark at over 55 feet. 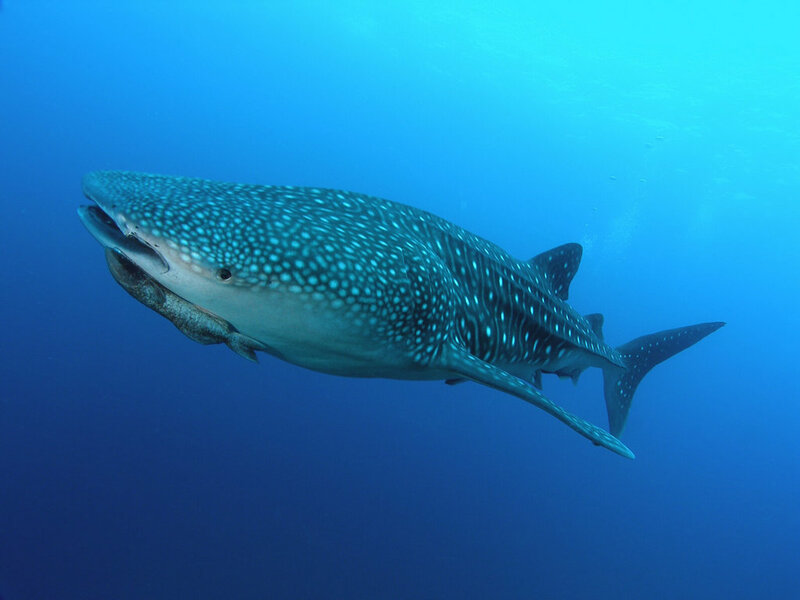 The whale shark is also the heaviest, weighing 80,000 pounds. The smallest fish is the tiny stout infantfish at only 0.3 in. The fastest fish is the swordfish, swimming at seeds of 40 mph. European eels live the longest, well over 80 years. Fish have been proven to be as intelligent as mammals. They can distinguish between larger and smaller quantities and can count. Fish clean and massage one another by rubbing up against each others’ pectoral fins. They have advanced nervous systems that allow them to feel pain. They have highly-developed hearing capabilities that allow them to detect electric currents in the water, and can create their own electric currents. Archerfish fire jets of water to knock insects off foliage and into the water, requiring complex calculus calculations. 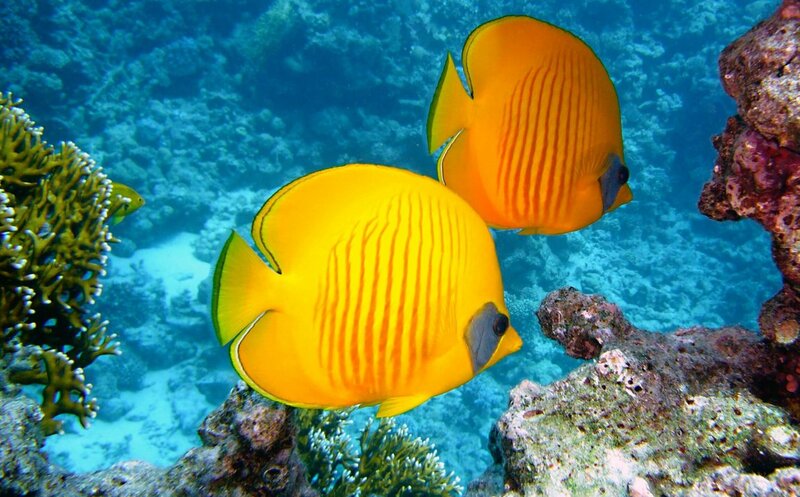 French angelfish mate for life and spend most of their time swimming together in their coral reef homes. When couples reunite after being separated, they joyfully encircle each other round-and-round in a romantic dance called "carouseling." Coral trout hunt in collaboration with moray eels. Cleaner wrasse perform rituals to coherce predators into letting them pick off parasites. Some fish protect their babies by opening their mouths and letting the babies swim inside until the predator has passed by. 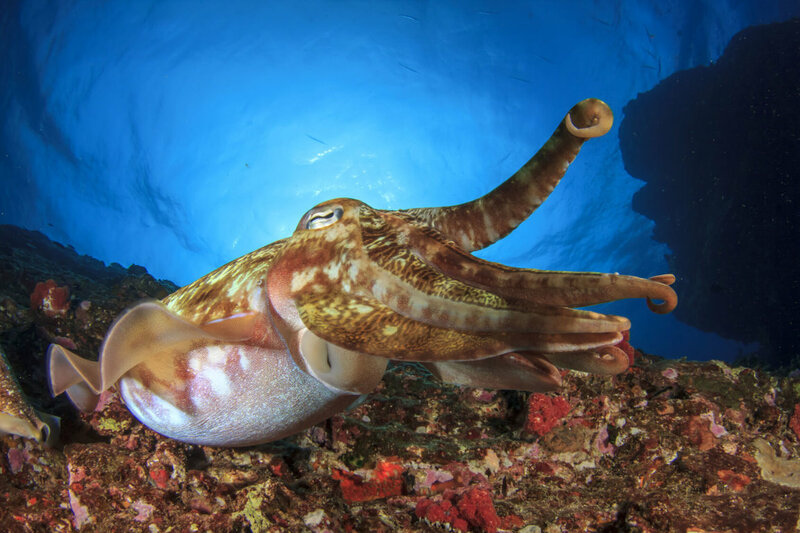 Squid are very curious, have the ability to learn complex skills and use tools to repress their boredom and protect them from harm. They can change their body color and texture to not only blend in with their surroundings, but to convey different messages on both sides of their bodies, such as projecting a mating color on one side and warning off a predator on the other. Fish live in groups with social hierarchies. 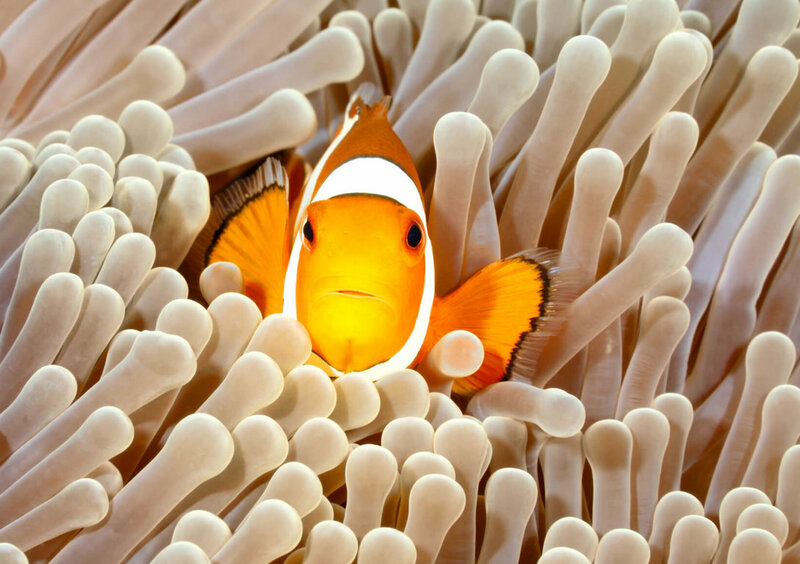 They are able to recognize individual family members, form bonds with other fish, cooperate and even tell time. Goldfish not only enjoy listening to music, but they also can distinguish one composer from another and detect complex properties of sounds, such as pitch and timbre. 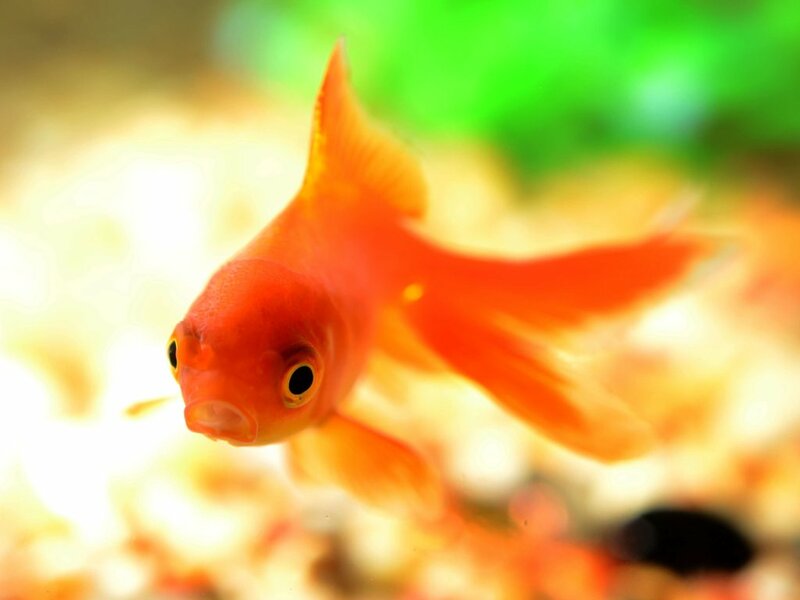 Goldfish can tell different faces apart and are able to distinguish between different shapes, colors and sounds. While fish may have different brain structures than mammals, they do have nervous systems that comprehend and respond to pain. Numerous studies have proven that fish feel and react to pain. Without the ability to feel pain, it would be impossible for fish to survive. Pain perception is essential to animal survival and has deep evolutionary origins across all vertebrate species. Billions of fish are killed yearly for food in the U.S. alone, with no federal laws to protect fish from pain on aquaculture factory farms, during fishing events or at slaughter.